There are only a small handful of apps I require to do design or print-production work: Adobe Creative Suite, a Web browser, and something to manage the 3,930 fonts currently residing on my Mac Pro. For the last few weeks, I’ve been using Suitcase Fusion 2 to manage the mountain of fonts on my system. Extensis released the $100 single-user font management tool last month. 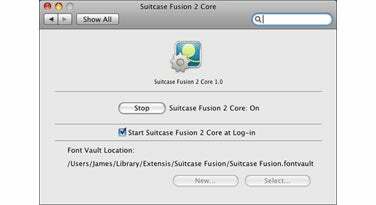 Fusion 1 or Suitcase X1 users can upgrade for $50. To my delight, Fusion 2 has done a remarkable job in stability, speed and usability. And I’d like to give you a tour of what to expect from Fusion 2, whether you’re new to the app or considering an upgrade. Font management in OSX has always been a bit of a headache. In particular, OS X installs a large amount of fonts in a myriad of locations on your hard drive. To make matters worse, Apple created the .dfont format, a single font file containing both the data and resource forks, specifically to work with OS X’s Unix underpinnings. The problem is that few if any font managers played well with the new format, causing a host of font conflict issues. Unlike previous versions of Suitcase, Fusion 2 no longer supports management of OS X’s System fonts. System fonts are listed in the source list in Fusion, but you can’t deactivate them. You can, however, still manage Local fonts stored in either Library/Font folder. While it may appear that Extensis just tossed their hands in the air and gave up, I consider it a huge plus. Management of System fonts never worked well in any font manager I’ve tried, and was tedious at best in previous versions of Suitcase. I suspect that Extensis also assumed that users who need font management probably know they can manually remove most fonts safely with only the need for an administrator password. You can download an informative PDF from Extensis’ Web site covering best practices for fonts in Leopard. 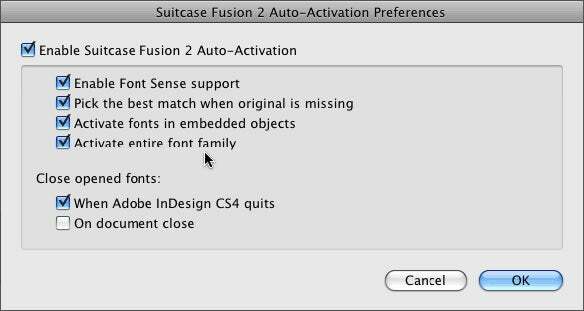 Suitcase Fusion 2’s Core preference panel can be set to have font activation run in the background. Also unlike previous versions, Fusion 2 does not have to be running in order to do its job. Thanks to the Fusion Core preference pane, font activation is handled by Fusion in the background. I love not having yet another application running all the time. In fact, the only time you have to actually open Fusion is to add or remove fonts from the database or activate new fonts that aren’t already used in your document. 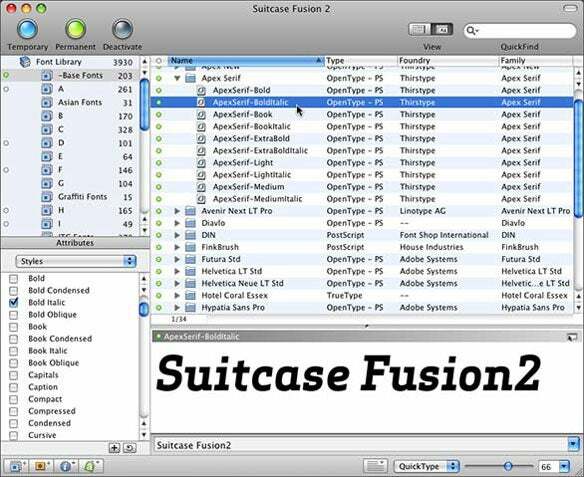 Suitcase Fusion 2 borrows its user interface from Universal Type Server’s client software. The interface is clean and simple to use, making much less use of menus to accomplish management tasks. In fact, I couldn’t find a reason to ever click a menu item. Any feature that isn’t found in Fusion 2’s main window can be accomplished with a keyboard shortcut. These include Collect for Output and Print Preview, which prints font specimen sheets from selected fonts. Three colored buttons reside in Fusion’s toolbar: permanent activation, temporary activation, and deactivate. Off to the right are two icons to toggle the preview pane on and off. And finally, there’s a search input box where you can search for fonts in Fusion’s database by name, foundry, classification, or font type. Down the left side, you’ll find the font source list, which contains a list of all the fonts in the database as well as any sets or smart sets you create. An Attributes panel below that lets assign keywords, styles and classifications to your fonts to help you find what you’re looking for in future searches. On the right side of Fusion’s main window, you’ll see the font list on the top, and the preview pane on the bottom. Across the bottom ,you’ll find controls allowing you to create font sets and smart sets and apply various settings to customize the preview pane. Smart sets are sets of fonts Fusion creates based on the data you specify. You can create sets of all your script fonts, or fonts with specific keywords. In the image to the right, I’m creating a Smart Set of all my fonts with the name serif and italics. Of course, this isn’t the best way to get what I want because many italic serif fonts don’t have those words in their name, but you get the idea. With more than 3,000 fonts, I expected to drag my font folder into the Fusion window and go to lunch while it checked all the fonts for corruption and imported them into the Fusion database. Surprisingly, the process didn’t take long at all—about 6 to 8 minutes in my admittedly loosely timed experience. You don’t have to import fonts into the Fusion database, though; you can choose to leave fonts in folders on your drive. However, taking that approach gives up several advantages, not the least of which is having one single database file that includes all your corruption-free fonts, keywords, and other metadata for easy backup. Fusion 2’s “tear off” font preview gives you a movable semi-opaque preview window of a font. Among one of Fusion 2’s handy features is the ability to “tear off” font previews, which creates a small window with your font preview in it (shown above). At first, the font is on a semi-opaque window, but it quickly fades to completely clear. You can move that window around on your screen, which allows you to overlay your preview font on top of your page layout document, giving you an idea of how the font will look in your layout. I thought this was a frivolous feature, at first, but I soon realized that it can be quite useful. Fusion offers auto font activation, via plugins, in Adobe InDesign CS3 and CS4, Illustrator CS3 and CS4, and QuarkXPress 7 and 8. In my tests with InDesign CS4, auto-activation worked perfectly with typically difficult fonts such as Futura and Helvetica where I have multiple versions of each font. Unlike past versions, opening documents with auto-activation was speedy and there were no mysteriously missing fonts in embedded objects such as Illustrator .eps or .ai files. InDesign itself also opened much faster than before with older versions of the auto-activation plugin installed. Another nice feature added to Fusion 2 is the ability to activate an entire font family. In the past, only the font used in the document got activated, but if you wanted to use another font in the family, you had to manually open it. With Fusion 2, when your document contains Futura Bold Italics, the entire Futura font family can be automatically activated, saving time and not interrupting your creative flow.